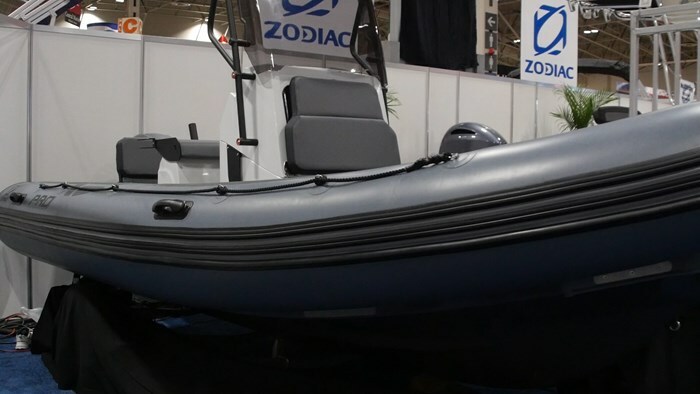 Most of the time when you think of a Zodiac you probably think of a small dinghy for your other boat. But in reality the brand offers so much more. One of their more popular segments of boats is their RIB line or Rigid Inflatable Boat. While they look like larger dinghies, RIBS are full on sport boats that can handle any task thrown at it. A prime example of this is the Pro 550. The Pro is the first in line of the RIB line of boats that steps up from the regular inflatables. With 4 models in this line, the Pro 550 is the smallest in this sport utility line of boats. 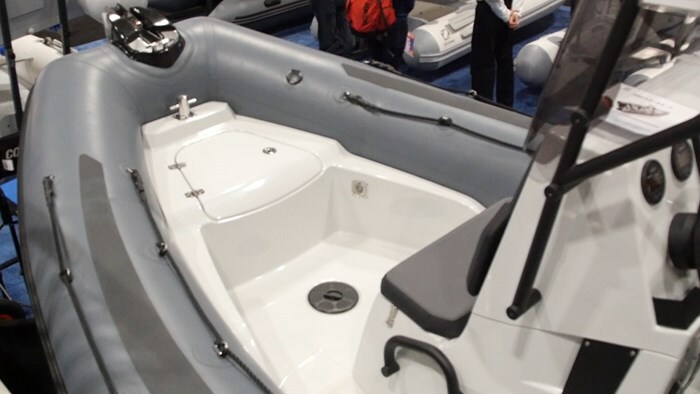 But at 18-feet 1-inch, the Pro 550 is a sizable RIB. One of the major benefits of a RIB is simply how light they are. As you might imagine, since most of the boat is made up of air. The Pro 550 weighs only 970 pounds. So what this also means is you can now use less horsepower to achieve the same performance that other sportboats get with double the horsepower. To prove this point, the max horsepower rating for the Pro 550 is 90. You think that’s not that much, but simply put, you don’t need it. Featuring a new design for 2017, the Pro 550 still features the main elements that have made it a success. One of which is deep-V hull that enables it to slice through rough water. As you slice through the water the tubes will keep you dry as they keep the spray away but also keep the boat afloat on the really rough stuff. Those tubes also extend past the transom to the motor, which is not just for looks. This extra running surface will act as stabilizer tabs for when things get really rough, almost like a hard chine. The point I am trying to make with this how safe this boat is. It will be a ton of fun to run in smooth water, but should things turn for the worst, not only will you be safe, but that’s when the real fun begins. My final point on this matter is that if you look at any police or military small craft fleet, they’re usually Zodiac RIBS. You’re not the military, but maybe you want a boat for the kids to run and get ice cream in at the cottage. Why not send them out in one giant bumper boat? 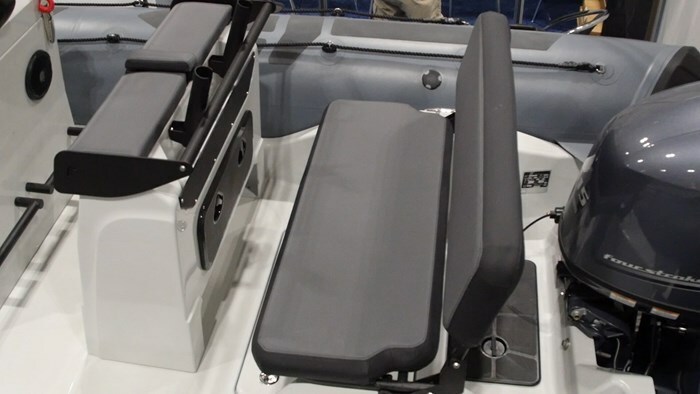 Inside the Pro 550 there is a lot of style and functional features as well that make it a well rounded boat. Entering the boat is easy because you just step right onto the Hypalon Tubes. You can sit here, but there is also dedicated seating. You have a large bench seat made for 2 adults at the stern of the boat, along with a nicely featured leaning post at the helm and a seat forward of the center console. So if you do the math, that’s seating for roughly 5 people, but the passenger capacity on the Pro 550 is 11. That’s because with a RIB you can sit on the tubes as well. There are grab ropes that run the length of the boat on either side. With a non-skid deck, self draining cockpit, a bow ring along with stern mooring cleats, the Pro 550 has all of the elements of a traditional runabout. In the bow area there is a deck you can sit down on, but there is also storage beneath that with a removable bin. Something else I found appealing about this boat was that all of the metal elements of the boat were black matte powder coated. From the grab handles, to the handle around the windscreen, to the rocket launchers on the leaning post and the hinges on the rear seat. They were all finished with a matte finish adding a touch of style to a usually utilitarian type of boat. 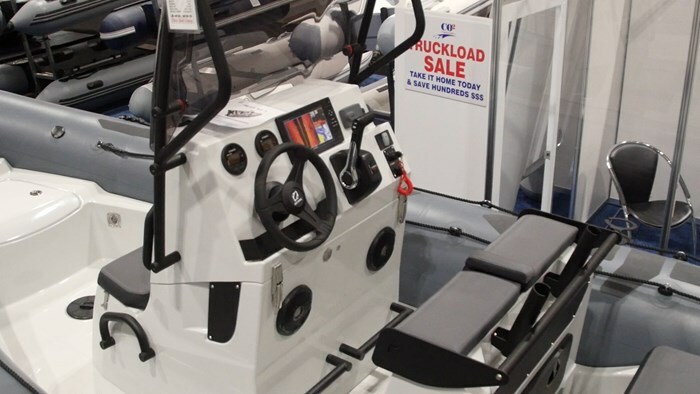 The helm on the Pro 550 that was on display at the Toronto Boat Show was fully featured. There were twin Yamaha gauges, a large chartplotter/GPS along with a stereo head unit. To me this shows that the intended buyer of this boat is the general family. The person looking for a boat that can do it all, and believe me, the Pro 550 certainly can.